Spiritual Vigor: These Are The Most, And Least Bible Minded Cities In America; How Does Your Town Rate? These Are The Most, And Least Bible Minded Cities In America; How Does Your Town Rate? Is your town one of the most, or least, “Bible-minded” cities in the nation? 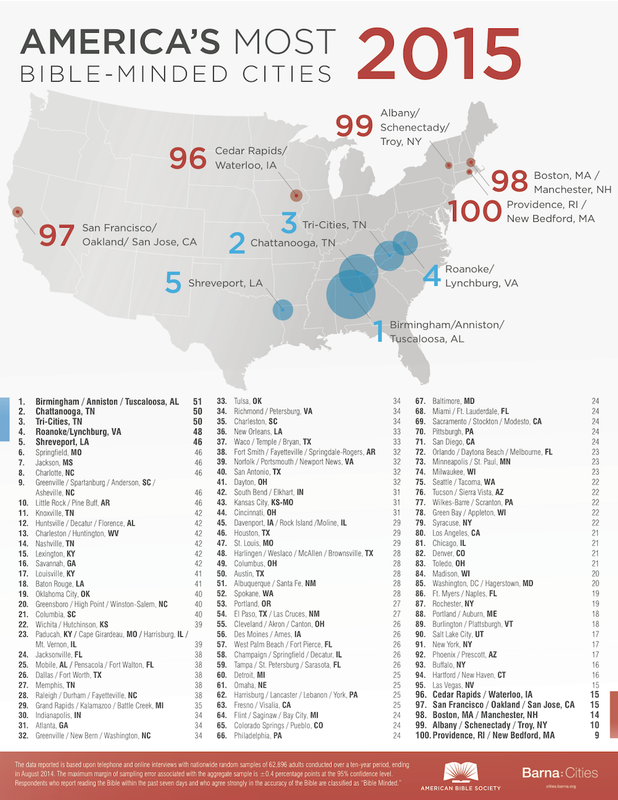 The American Bible Society has the answer with the release of its latest report that ranks 100 U.S. cities based on residents’ devotion to reading the Bible and their overall opinion of the Christian scriptures. The most Bible-minded city in America in 2014 was Birmingham, Alabama, according to analysis of data collected by the Barna Group. The top spot belonged to Chattanooga, Tennessee, in 2013 and to Knoxville, Tennessee, in 2012. But it appears that Knoxville dropped out of the top 10 for the first time in 2014, coming in at number 11. And the cities with the least Bible-minded citizens last year were Providence, Rhode Island, and New Bedford, Massachusetts, tying for the 100th spot; these cities came in the same place in both the 2013 and 2012 waves of the study. The rankings are calculated using data collected by Barna Group. Each city’s Bible mindedness is determined by analyzing survey respondents’ Bible reading habits and beliefs about the Bible. The most Bible-minded respondents said they had read the Bible in the past seven days and believe strongly in the accuracy of the Bible. Nationally, only 27 percent of the population was considered Bible minded. This year’s rankings from the America’s Most Bible-Minded Cities study show many differences from usage statistics for American Bible Society’s Bible search engine, Bibles.org. Louisville, Kentucky registered the largest number of searches on Bibles.org while Syracuse, New York registered the fewest searches of any of the top 100 markets. “Online rankings consider only one data point — Bible search behavior — while American Bible Society’s Bible-Minded Cities survey examines both behavior and attitudes about the Bible to harvest a more authentic survey of each city’s population. This provides a more three dimensional view of a city’s real Bible mindedness,” said Andrew Hood, managing director of communications at American Bible Society.